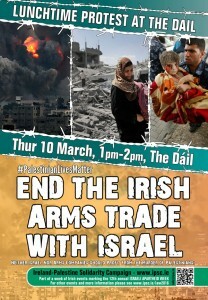 As part of Israeli Apartheid Week 2016, on Thursday 10th March from 1pm to 2pm, we ask you to join the Dublin branch of the Ireland-Palestine Solidarity Campaign for a lunchtime protest outside Dail Eireann (the Irish parliament) calling for an end to the obscene arms trade with Apartheid Israel, and ensuring our government know that #PalestinianLivesMatter. This event is organised by the Ireland-Palestine Solidarity Campaign (IPSC) as one of a series of events taking place around Ireland during international Israeli Apartheid Week 2015 (5th – 13th March). See the IAW 2016 page for a full list of events taking place around Ireland.